Starting a new garden is always an exciting undertaking. This time around, I'm learning from past mistakes. So the rows are all straight and perpendicular to the (not-yet-erected) fenceline. Perennial bed widths are planned based on their eventual occupants --- narrower for asparagus and wider for brambles. And aisles are a universal 29 inches wide. 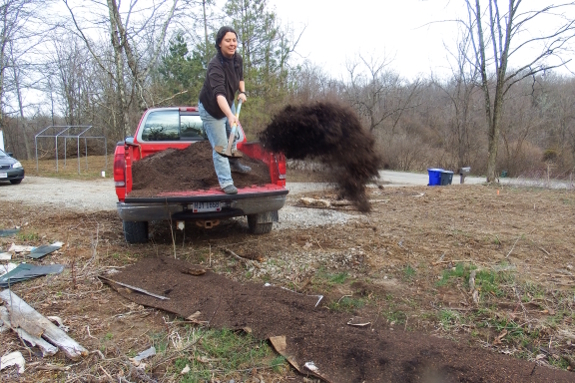 I'm going with the ultra-simple kill mulch in most areas --- compost over cardboard --- although I know I'll have to deal with some perennial weed intrusions over the course of the first year. Blueberry-bed preparation is more complicated, though. Stay tuned for details in a later post! Any reason for 29 as opposed to... say 30? Kayla --- I love your positivity! Eric --- I know that's the oddest number! We actually started with a width of 24 inches, figuring we should maximize space. But as I started laying out the beds and imagining them full of overflowing plants while I tried to wheel a loaded wheelbarrow between them...it just felt too close. So I inched the aisles wider until it felt good, which happened to fall on a prime number.